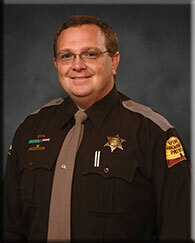 Aaron Beesley joined the Utah Highway Patrol in January 2000. He started his career at the Utah State Capitol. In August 2001 he transferred to Section 2 Weber/Morgan County where he excelled in technology and became a (FTO) field training officer. He served with the DPS SERT team as their communications and technology specialist. In November 2005 he transferred to Section1, Box Elder County, where he continued his technology work. In 2009 he started to work with the aero bureau. He saved the department hundreds of thousands of dollars making the equipment on the helicopter work more effectively and developing new tools to make the helicopter program more useful. He helped saved numerous lives both as part of the aero bureau and while working in the field. Aaron took a new assignment in June 2011 with the Utah Highway Safety Office compiling and gathering crash data from every police agency throughout Utah. Aaron was also the assistant Fire Chief of the Corinne City Volunteer Fire Department. On June 30, 2012 he was participating in a Search and Rescue mission with the aero bureau and had helped rescue two stranded hikers from off of Mount Olympus in Salt Lake County. While the pilot was delivering the hikers to ground crews it appears Aaron attempted to retrieve his medical bag and lost his footing and fell approximately 90 feet where he died instantly.